In fine weather conditions 51 participants gathered at the Somerset Drive carpark and were well entertained by a nearby family of Tawny Frogmouths. One stood guard in an adjacent tree as its mate endeavoured to conceal two fluffy chicks which kept popping out from under its protective feathers. This was to be the first of six pairs found during the day. The group walked first to the main lagoon in which the water level was rather high with no surrounding mud, hence the lack of any of the often present waders. However, there was plenty to be seen on the water including a pair of Pink-eared ducks with young and a pair of Pacific Black Ducks with nine very small ducklings. A few Hoary-headed Grebes as well as several other duck species were identified. 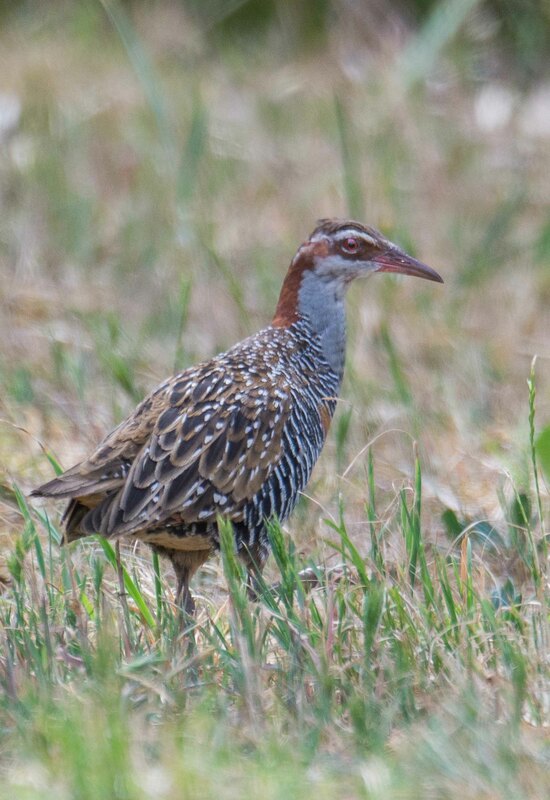 An Australian Spotted Crake was briefly seen by a few lucky observers. The dead stags in the middle of the lagoon provided perches for many birds, including Red-rumped Parrots as well as both Little and Long-billed Corellas. The beginners then set off towards the river and saw Eastern Rosellas, Galahs and more Red-rumped Parrots feeding in the grass beside the track. Noisy Miners and Red-wattlebirds were dominant in the trees and very few other honeyeaters were seen. Along the riverside track Grey Fantails were plentiful and a Grey Shrike Thrush was gathering nesting material. A Fan-tailed Cuckoo could be heard making its trilling call on the opposite side of the river but was not seen. On the track leading away from the river another pair of Tawny Frogmouths was seen, but this was eclipsed by wonderful sightings of a pair of Mistletoebirds. These birds remained in the dead trees and nearby mistletoe for several minutes enabling everyone to have a good look. For many of the beginners this was a ‘lifer’. Walking back towards the cars the only raptor of the day, a Brown Goshawk, was seen flying overhead being harassed by a little Raven. Lunch was eaten at the edge of the oval during which a pair of Australian King Parrots flew past and landed in the grass. After this a second shorter walk was taken up to the “Grotty Ponds”. A pair of Purple Swamphen was seen there, though sadly no crakes. 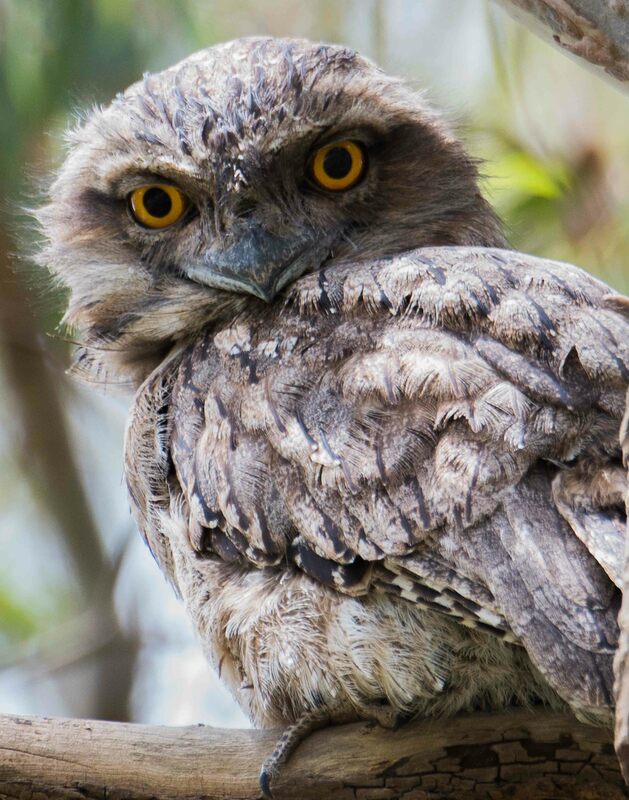 Four further pairs of Tawny Frogmouths were located, giving a total of six pairs for the day. Banyule Flats certainly lived up to its reputation of being the Tawny Frogmouth capital of Melbourne! On returning to the cars a final birdcall recorded 56 species for the day – an excellent result for a suburban park. September and October are traditionally the busiest months for education activities and this year is no exception. We started with three different activities on Friday, 8 September. Firstly, on 8 September Pat Bingham led members of the Deepdene U3A on a birdwalk through Banyule Flats. 11 people attended and 32 species were seen and a good time had by all. Lyn Easton (who happened to be doing her regular morning walk in the area) showed them a Tawny Frogmouth on a nest. At the swamp they saw Hardheads, Chestnut Teal and Australasian Grebes. Several pairs of Red-rumped Parrots disputed over nest hollows in the old trees in the swamp. Along the Main Yarra Trail they saw a Fan-tailed Cuckoo and had a pair of Gang-gang Cockatoos fly over. Also on Friday, 8 September Janet Hand addressed the Hawthorn Glen Combined Probus Club in Camberwell. About 60 members were present to hear about the birds found in the area. Many expressed their surprise at the large number of species around. That afternoon Janet Hand, Bill Ramsay and Ron Hand set up our display and information stall at the Eltham Plant Expo at the Eltham Community Centre. The Expo ran on Saturday and Sunday 9-10 September and was run by the APS Yarra Yarra branch of the Australian Plant Society. Many other ‘plant related’ organisations were present as well as many plant sales and displays. Over 700 people attended over the weekend. This number did not include the organisers and helpers at the different displays. Janet Hand was assisted over the weekend by Elizabeth Ainsworth, Daphne Hards, Susan Bailey, Sally Heeps and Anthea Fleming. The monthly Hawthorn U3A Birdwalk on 15 September was at Wattle Park. 14 people attended on this warm morning with lovely wattles and a big patch of Nodding Greenhood orchids but rather few birds (11 species). 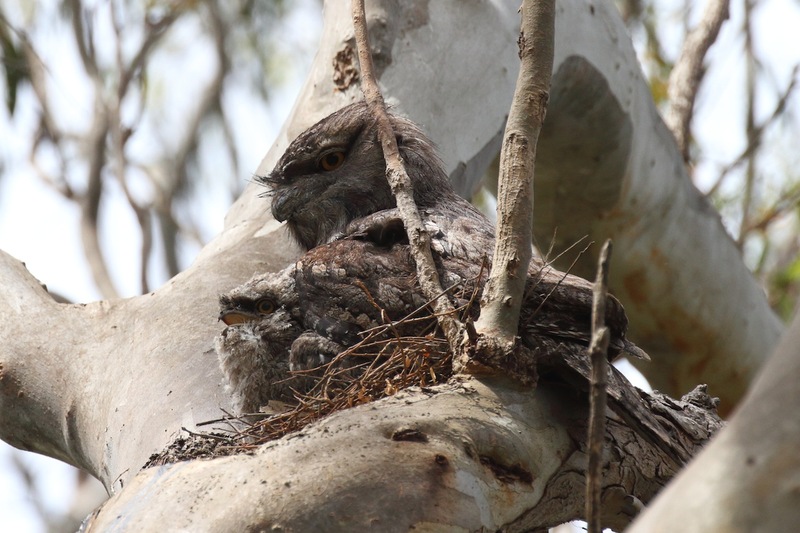 They saw a Tawny Frogmouth on a nest and found another pair, surviving, but their nest had been destroyed and broken egg-shells were on the ground beneath the nest site. Once again Pat Bingham led this walk. Also on 15 September Graeme Hosken led a group of 12 people on a bird walk to celebrate the 40th Anniversary of Fairy Dell. This area was part of the old Healesville Freeway reserved land behind the Wantirna shops. Much of the land was sold for development but this section was saved. On Monday 25 September Susan Bailey addressed the members of the Darebin U3A. She spoke about the birds found in that area of Melbourne. With over 50 people attending it was the second largest crowd at a function this year. The topic obviously created a lot of interest and discussion. ‘Attracting birds to your garden naturally’ was the subject of Janet Hand’s Powerpoint to the ladies of the Yarra Valley VIEW Club at Chirnside Park on Tuesday 26 September. Fifty ladies were present for this luncheon and presentation. On Thursday 28 September Janet Hand made her annual visit to the ladies at the Mercy Hostel in Boronia. This hostel is a member of BirdLife Australia and they are blessed with a range of birds visiting their gardens. The topic changes each year but it was back to the basics of talking about local birds again this year. My thanks to all those who have assisted this month. 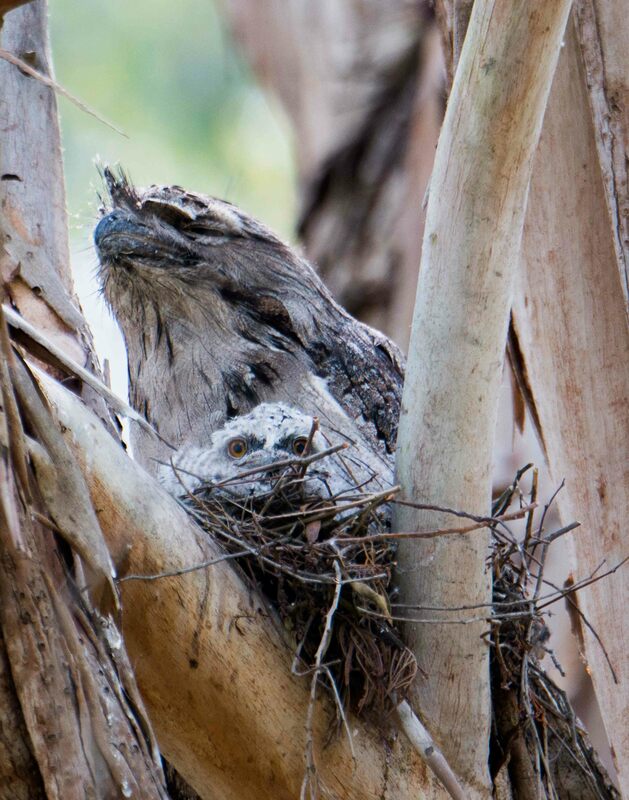 Despite a very poor weather forecast, 36 members came to Banyule Flats and were delighted to see a resident Tawny Frogmouth on a nest beside the car park. Setting off towards the swamp, a male Mistletoebird, a Grey Currawong and a pair of Common Bronzewings provided good sightings. After the heavy winter rains the swamp was full to overflowing and so there was no visible mud available for waders. A lone Pacific Black Duck was the only duck to be seen and a Dusky Moorhen made a brief appearance ‘running’ across the water. Little Pied and Little Black Cormorants perched on the dead trees in the water, whilst male and female Red-rumped Parrots investigated nest hollows on the same trees. Taking the track around the billabong there was little bird activity, though a female Golden Whistler, a pair of Black-faced Cuckoo Shrikes and a pair of Laughing Kookaburras were seen. Upon reaching the river a second male Mistletoebird and several Red-browed Finches provided clear views and a few lucky members saw a pair of Sacred Kingfishers in bright breeding plumage. Several birds were heard but not seen, including Fan-tailed Cuckoo, Shining Bronze-Cuckoo and Rufous Whistler. Noisy Miners were the most evident species, being present on almost all sections of the walk. The forecast rain then began to fall as the group quickened pace on the walk back to the carpark. Due to the inclement weather it was decided to take a second short walk to the ‘Grotty Ponds’, before lunch. This yielded two further Tawny Frogmouth nests, each occupied by one of their respective pairs, with the other partner also located nearby in each case. Also, Australian Wood Ducks were loitering near the track but neither crakes nor rails were found. The rain then became torrential and the wind blew very strongly and so it was decided not to have an afternoon walk. Lunch was eaten in the shelter of the sports pavilion and it was amusing to watch six Pacific Black Ducks enjoying the soggy conditions of the oval. Although most people went home rather damp there had been some very good sightings and several new members were very enthusiastic and vowed to return on a sunnier day. Grateful thanks go to Eleanor Dilley and to our overseas visitor Yun Shao for providing excellent photographs taken in difficult conditions. A total of 47 species was recorded. A warm and humid day did not deter 16 birders and photographers from assembling in the car park. Our leader, Lyn Easton, led us down to the main wetlands where eyes, bins and scope were kept busy. Highlights were Latham Snipes on the mud and the most frequent conversation was the question and answer about their location as they moved around. An Australian Spotted Crake was also seen by a few but was less cooperative than the snipes. It appeared that Buff-banded Rails were not to be on the list but once we reached the grotty pond several were seen on the edge and among the grass, delighting photographers. Waterbirds included Silver Gulls (using nest boxes), Eurasian Coots and Australasian and Hoary-headed Grebes plus Chestnut and Grey Teal and Pacific Black Duck. No swans were seen. Other sightings in this area included Little Corellas, Superb Fairy-wren, Red-rumped Parrots and Welcome Swallows. 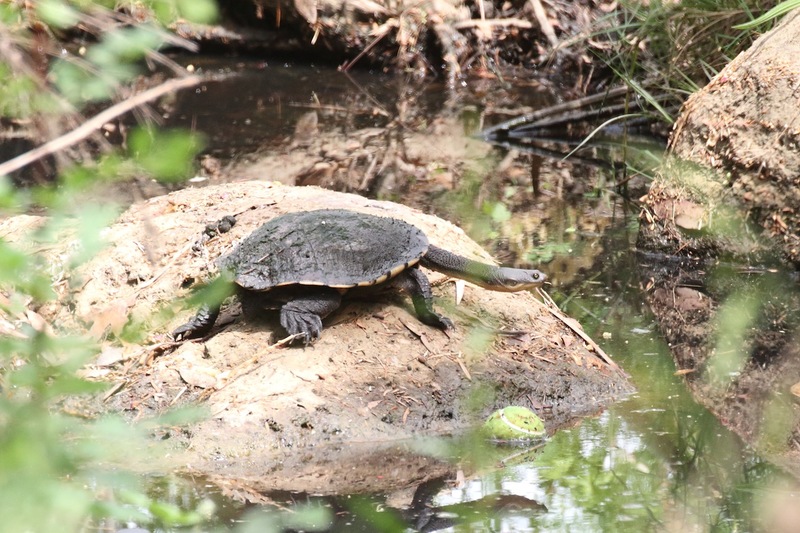 Also present were Long-necked Turtles sunning on logs. The walk around the western side of the wetlands didn’t yield much, unless you counted Red Wattlebird, Purple Swamphen and Common Blackbird, though glimpses of White-browed Scrubwrens were had by some. A very recently fledged Little Raven had a conspicuous pink gape. We walked past the 2005 centenary planting by BOCA which showed good growth over the past decade. Hopefully this will support birds. Back to the car park and lunch in the shade of the trees. The afternoon walk was beside the river towards the power lines and was notable for the number of nesting Tawny Frogmouths observed. Cute little heads watched us from below their parent while the brooding parent sat quietly vigilant. 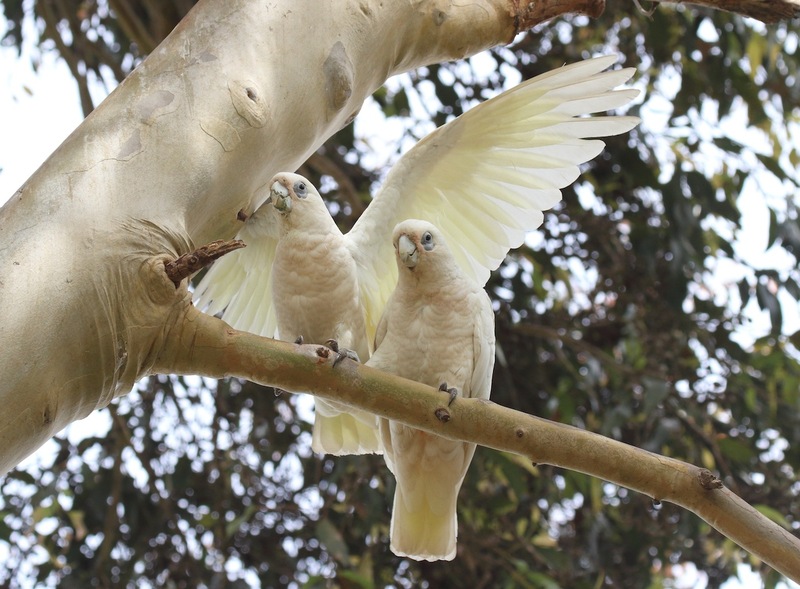 These were not the only breeders – Noisy Miners attended to noisy chicks and Grey Butcherbirds were importuned by brown youngsters. Rainbow Lorikeets appeared at tree holes and thornbill nests were noted in bushes. Sacred Kingfishers were nesting in holes in the river bank close to a female Australasian Darter on a snag drying her wings. After several calls Mistletoebirds perched in clear view to everyone’s delight. No raptors were reported for the day. A call was initially interpreted as a Whistling Kite but Lyn’s extensive experience corrected this. At least one Common Blackbird has been observed mimicking a kite call which it had added to its repertoire. Another challenge for birders is mimicry. By walk’s end the bird call totalled 61 species and at least one person had notched up two lifers. Our thanks to Lynn were heartfelt and numbers of us are planning return visits. Despite the weather forecast predicting a very hot day, 41 members came to Banyule Flats and enjoyed what turned out to be a comfortably mild day. Early arrivals were given the task of finding two Tawny Frogmouths known to be in the triangle of trees adjoining the car park. Several succeeded and others were shown their typically well-disguised positions. The lake was the first location visited and it did not disappoint. The surprisingly high water level dictated the species to be seen on it, with Australasian and Hoary-headed Grebes present along with the common duck species, Eurasian Coots and Dusky Moorhens. Black-winged Stilts waded near the lake edge and a Buff-banded Rail wandered along a rare mud bank exposed at the northern end. A flock of Red-rumped Parrots flew into the water-bound dead trees, affording excellent views, and an Australasian Darter soared high above. The walk continued around the dry billabong to the windmill, where local expert Anthea Fleming pointed out a Mistletoe Bird’s nest. It had recently been vacated following the successful raising of chicks. The rear half of the group studied, presumably, one of the young birds which was located high in a nearby dead tree. Those in the front half of the group, having walked on, were duly miffed to have missed out on this sighting. After lunch a short walk to the ‘grotty pond’ rewarded us with a brief sighting, for some, of a flushed Latham’s Snipe and a lengthy sighting, for all, of a Spotless Crake foraging in the mud between the rubbish and the reeds. A Purple Swamphen with three crake-sized chicks added to the interest. 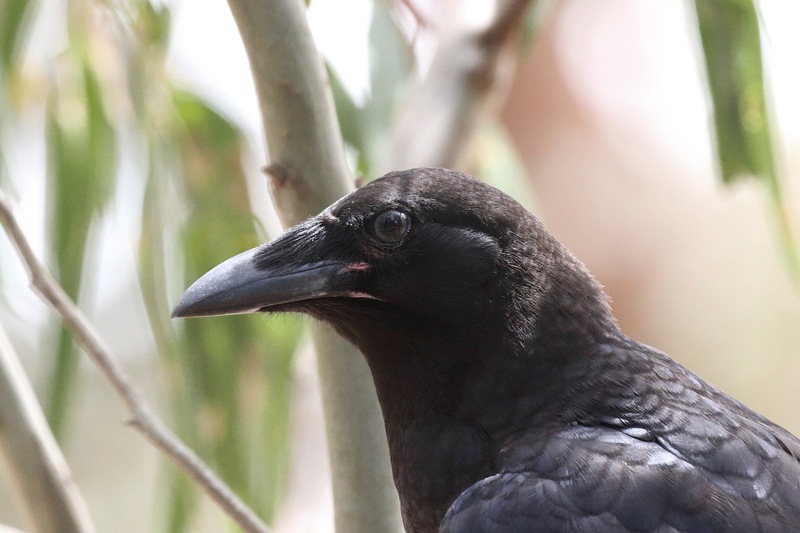 In the nearby trees a family of Grey Butcherbirds was feeding, seemingly posing for the photographers amongst us. A delightful outing ended with a bird call of 56 species..
An overcast morning greeted the 50 attendees that made their way to the swamp for the first part of the outing. The water level was very low, leaving wide mud-banks and a small pool to be surveyed. A lone Latham’s Snipe was a highlight, with a single Red-kneed Dotterel and several Black-fronted Dotterels to be seen, together with the more common ducks. A Little Eagle passed overhead, affording only a brief view. The ‘Grotty Pond’ was visited next, where three Buff-banded Rails were spotted separately foraging. The resident Spotless Crake, seen many times in recent days, failed to appear despite the many searching eyes. 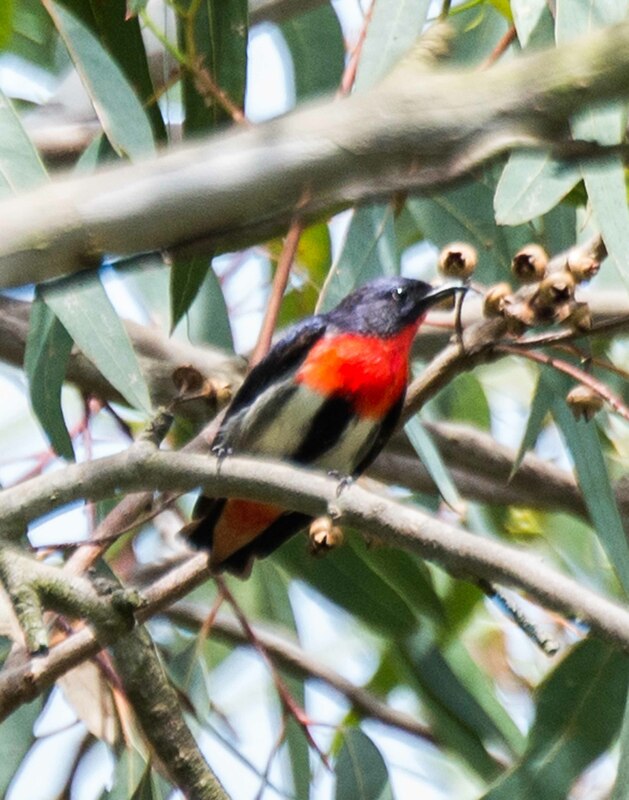 Red-rumped Parrots, Galahs, and a pair of Eastern Rosellas were all located around the Oval. Lunch was enjoyed alongside the trees in the triangle next to the car park, where two Tawny Frogmouths were quickly spotted. Trying to get everyone ‘on’ to them was a major (though rewarding) task, due to the cryptic poses of the birds. After lunch, most of the group walked down the Windmill Track and along the river, where Golden Whistler, Black-faced Cuckoo-shrike and Dusky Woodswallows displayed themselves on dead trees. A young Echidna was also seen and much photographed. On the return track, a Sacred Kingfisher and another Tawny Frogmouth brought the outing to a fitting conclusion. Finally, thanks to Anthea Fleming who shared her local knowledge, and telescope, with us at the swamp.